In this paper we present an experimental approach aimed at assessing the correlation between fracture toughness (K IC) and fracture roughness of two granitic rocks (Barre and Stanstead granites) exhibiting significant fracture toughness anisotropy. Roughness values have been estimated for fractured surfaces obtained from Chevron Cracked Notch Brazilian Disc samples failed under mode I along three orthogonal planes with respect to their microstructural fabrics. There exists a clear correlation between roughness and toughness within each rock examined along the three planes. Specific orientation of micro-crack alignment could result in preferred out-of-plane propagation of the test-crack irrespective of grain-size distribution. 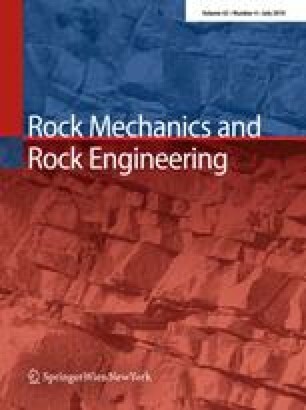 These experimental observations reinforce the hypothesis of the existence of a link among pre-existing petrofabric anisotropy, fracture toughness, fracture roughness, and the evolution and extent of the associated induced fractures within the process zone of granitic rocks along specific directions. This study also highlights the need for employment of pre-failure and advanced post-failure diagnostic techniques in quantifying these inter-relationships. The authors wish to thank Dr. SH Cho and his associates for their assistance in the CT-scan work, Dr J. Wirth and Mr. M. Braun for their assistance with the surface scans. The research work has been partially supported by NSERC/Discovery Grant No. 341275 and NSERC/RTI Grant No. 345516.